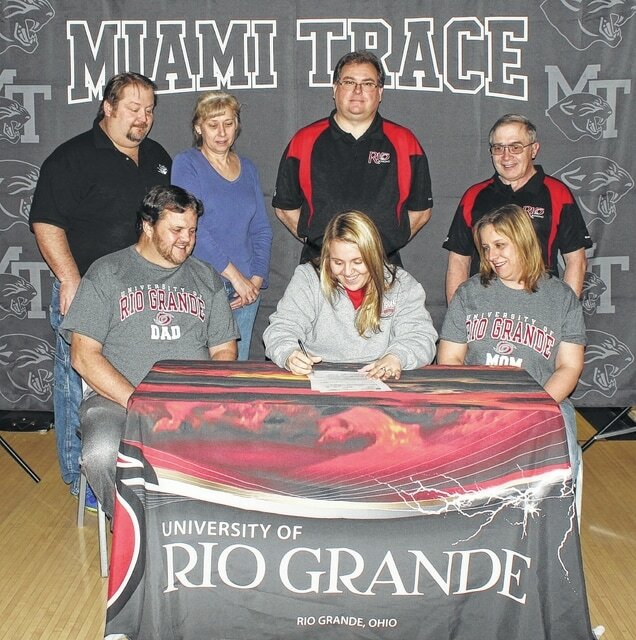 Miami Trace High School senior Macy Detty, seated, middle, signed a letter of intent on Wednesday, Feb. 15, 2017, to attend the University of Rio Grande where she will be a member of the women’s bowling team. She is flanked by her parents, Scott and Sissy Detty and joined by Ron Amore Jr., Diane Amore, of LeElla Lanes and Rio Grande head coach Bret Little and assistant coach Phil Karl. 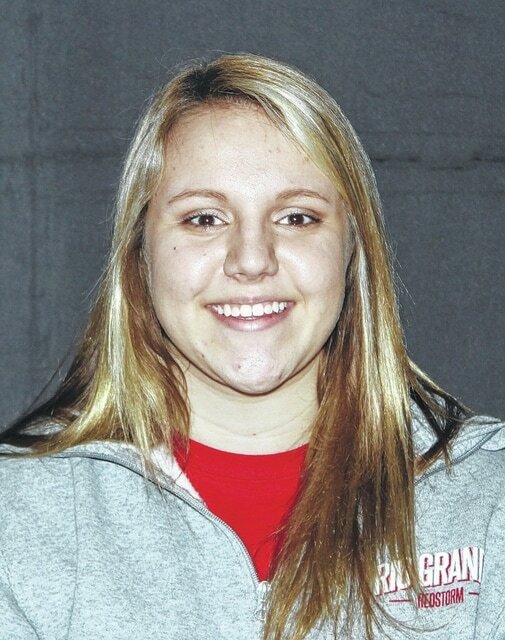 Miami Trace High School senior Macy Detty signed a letter of intent Wednesday, Feb. 15, to attend the University of Rio Grande where she will continue her athletic career as a charter member of the first-ever Rio women’s bowling team. Detty, who has bowled since the age of eight, has been the top bowler in the South Central Ohio League the past three seasons. Detty recently won the SCOL tournament with a 659 series. She had a season average of 202, which also topped the league. “My sophomore year, I was in a travel league” Detty said. “That’s where I met Bret (Rio Grande bowling coach Little). He was talking about starting a team at Rio and that’s when he started recruiting. Detty is going to study diagnostic medical stenography at Rio Grande. “Basically that’s taking ultrasounds,” Detty explained. What were some of the subjects of which Detty is fond? Detty explained the challenges of competitive bowling. “It’s not like in tennis, or another sport,” Detty said. “You’re bowling them on the lanes. The lane conditions are what can make bowling complicated. Your bowling them, but the thing you’re competing with is the oil that’s laid down on the lanes. You’ve got to compete to the best of your ability and you’re forcing the person that you’re bowling against to compete to the best of their ability. “There are different oil patterns that are on the lane,” Detty said. “With every shot you throw, that oil pattern gets changed just a little bit. Then you have to adapt as you keep going. A line will get dry; the oil will move. The more oil, the less the ball reacts; the less oil, the more the ball reacts. That’s the hook you’re putting on the ball. “When you compete against people in the SCOL, there are some girls that don’t put a lot of hook on the ball,” Detty said. “So, that pushes the oil down for people who hook the ball more, swoop the ball out and make it kick back to the pocket. That’s the part you’ve got to compete on during matches. What about most favorite moments, such as the team going to State in 2015? “We really worked hard that season,” Detty said. “We came together as a team. We won Sectionals and we won Districts. As a team of sophomores and juniors, that was kind of a big thing for us.” Miami Trace also won the SCOL that season. “In the last three years, Macy’s gone up in average between 30 and 40 pins,” Miami Trace coach Kaleb Taylor said. “She’s really improved and continues to get better. “She’s been a huge leader on the girls’ program the last three years,” Taylor said. “Everybody kind of looks up to her because of how good she is. She’s a vocal leader. “I’d like to thank my parents,” Detty said. “No matter what, they’re always supporting me in everything I do, whether it be 4-H, or school, or sports and after-school activities, too. “I’d like to thank my coaches. Kaleb Taylor, he’s gotten me to where I am now,” Detty said. “And, Ron Amore Sr., he’s helped out a lot, as well. And then, Ronnie and Diane here at LeElla Lanes. This is my second home, so, they are like a second set of parents for me. Detty was also a four-year member of the Miami Trace tennis team and is a member of the spring musical. Detty has an older brother, Ryan. She is the granddaughter of Anna Lee Detty and the late Ralph Detty and Eugene Davis and the late Wynona Davis.